Today we are sooo happy to have our Project Run and Play Season 4 winner with us today. Jessica is a talented seamstress with mad boys clothes making skills and after reading her post you will never look at sewing for boys in the same way again. Competing in Project Run & Play was the best thing I've ever done for my creativity. And it really made me realize how much I LOVE sewing for my boy. Hendrix is 3 and was a big reason I got really into sewing. At first, it wasn't really clothes for him, nothing beyond the obligatory appliquéd onesies. But then I started making a few simple things and realized that it was really satisfying to see something I made actually functioning adorably on my child. I kept learning how to make different items for him, pants, knit shirts, and even a coat once. But I didn't realize exactly what my boy style was until my season of PR&P. Here's the thing about sewing for boys- it's harder. I really think it's more challenging to make a unique and stylish boy outfit than it is to make an adorable dress for a girl. Girls will look cute in almost anything you make them. And there are a hundred sewing tricks at your disposal to embellish their clothes. You can pleat them, ruffle them, gather and trim them all day long. You can literally use any print or pattern for their clothes. But it's not that simple with boys. It takes a lot of thought about colors, fabrics, proportions, and details. Don't get me wrong, I'm not saying the sewing is actually more difficult. But I think people just aren't sure how to make their boy clothes special enough to be worth the time it takes to make them. I work in a local fabric shop and I hear from people all the time that they don't have any desire to sew for their boy, so the girl(s) in the family get all the goods. 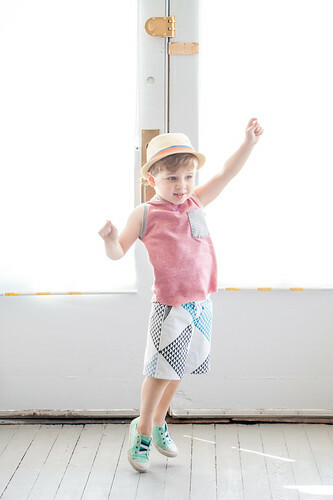 It makes me want to jump up on the cutting table and start ranting about how great it is to sew for boys. Of course I don't, so I'll just do that to you guys here now. These were the boy looks I made for the competition. I wanted to use shapes I had not seen before around sewing blogs, and shapes you couldn't find in any Target or Old Navy. The cropped pants with pockets (boypris!) still turn heads when he wears them because they look like an expensive boutique pair of pants. The details like contrasting yellow topstitching, bright pops of color on the pockets, and the hand stitching on the tank make all the difference in the world. Without any one of those small things, the pieces wouldn't feel as special. On the raglan shirt, I used fabrics straight from women's shirts and an embroidery technique usually reserved for the girls. But on a three year old, these things work and still look boyish. Here's the rule when it comes to looking at trendy men's fashion: if your husband would look completely ridiculous in it, then your kid would probably look completely adorable in it. Even as I was making these color blocked pants, my man was calling them clown pants. 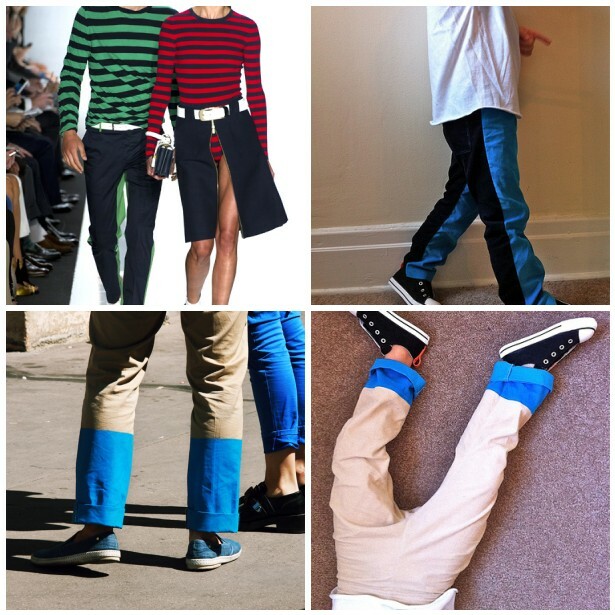 "Why can't you just make him some normal jeans to wear?" (My response: Well we can just buy him some of those for $10!) But as soon as he saw Hendrix in them, he couldn't help but smile at how well he pulled them off. These, you can't buy at Target. As I said, I'm constantly inspired by pop culture. I love movies, TV, and music. I'm obsessed with a certain selection of directors, I know every lyric on the radio, (even the crappy stuff, usually) and I can't get enough of shows like Parks and Rec or The Walking Dead. It all pops up in the clothes in certain ways. Fellow PRAP alum Kristin and myself have started a series called Film Petit that marries our love of great movies and sewing for kids. You can find out more about all these movies and looks here. 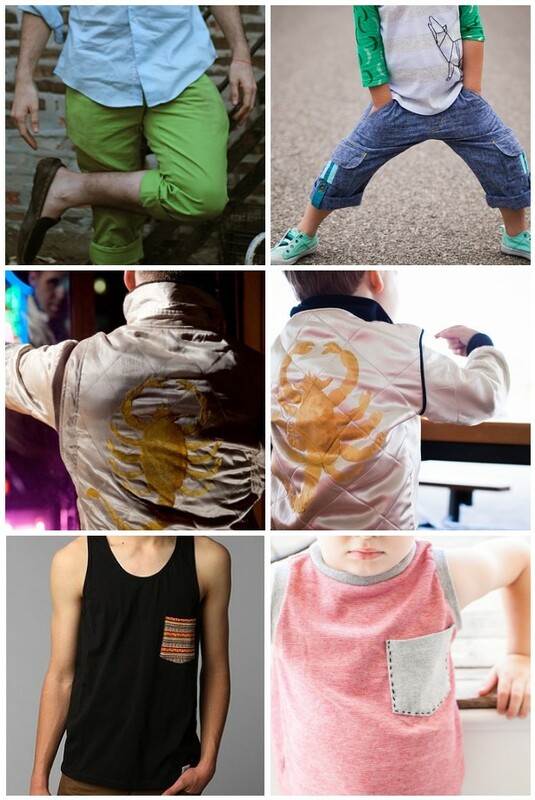 And it all started with that scorpion Drive Jacket I made for movie week last season. That was one week that I got pummeled in the voting, but I didn't care because I loved it so much. Of course, not everyone is inspired by these same things. But you are inspired by something that you love. Something that's just you. You can put that into your boy clothes while they are young, I promise they won't protest. They will know that you had so much fun making them. Speaking of fun, I think that's really the takeaway here. Sewing for boys is fun. It can make your husband's Will Ferrell shirt live on to crack you up a little longer. It can lead you to make a purple tank that also has rain on it without even realizing how Prince that is until you are done. It can make you enjoy a whole summer at your very midwestern pool watching your kid skip around in a little blue euro-short. Details are super important. Use them thoughtfully. Look at what the uber-fashionable are wearing. Your kid can work that stuff. Don't limit yourself to expected boyish color and fabric choices. Be inspired by something you love, something around you in the world outside Pinterest. Have fun with it. Sew things that will make you smile when you see him wear them. Thanks so much for having me back here, I can't wait to see what these talented ladies sew up for the boys! Great post! I have twin boys I do sew a lot more for my daughter. Thanks for the boy sewing pep talk! Love the things that Jessica creates for her little boy. Thanks for the inspiring insight! Woot for little boys! Jessica is right too. It is an important guideline to think, if my husband wouldn't wear this, don't make it for your little man! Jessica you are officially my favorite blogger (after Garance Dore - fair enough right ;-) I love what you make AND what you write. Clever and funny! And I love love love the Film Petit series! Just wanted to put it out there. I love everything you wrote here, Jessica! It's true I haven't felt inspired yet to make something for my boy because I feel like it is not worth the time (when I can buy the pants for $10). I always try to dress him the way my husband would dress, so I will need to instead think more like you, because Hendrix looks amazing in everything you make him! 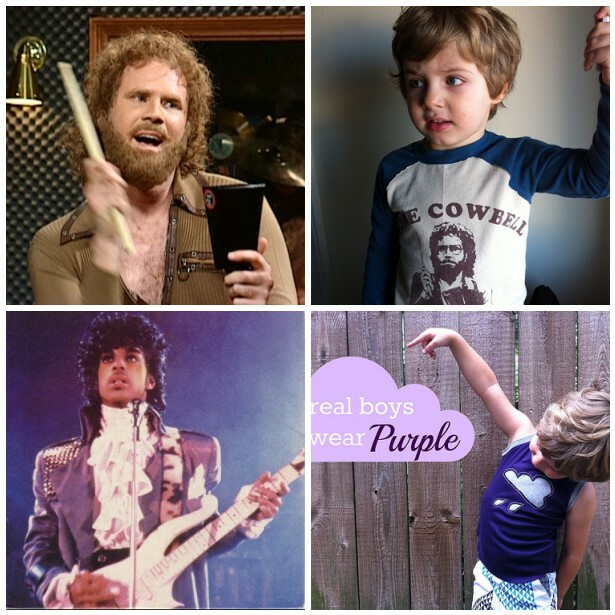 That cowbell shirt is also amazing. Brilliant tips and I love all the boy clothes Jessica has included here. I love sewing for my boy! I'll jump up on the sewing table and rant with you (which made me laugh, even though I don't know you, I could imagine you doing that)! I think sewing for boys rocks and you do it very well! You just echoed all my thoughts about sewing for boys! Since I only have a boy, I don't even have a chance to sew for girls but I'm having lots of fun with boy sewing. You just totally justified my thinking that the bright blue super skinny jeans I just made for the little man look cute and not weird because he's only 18 months and at the age where he can pull it off:). Thanks for some more helpful advice on where to find boy clothes inspiration! Jessica, you do a great job sewing for your boy! My son is 8, so he is getting a bit more discerning in his clothes (i.e. less fun!). I take a lot of inspiration from high fashion. They have interesting lines in their clothes. Some is definitely a bit TOO interesting to ever work for a kid, but it gives me ideas. I also am a huge user of stencils and fabric paint when it comes to his clothes. In looking at my sewing for him in the last year...he has been terribly neglected compared to his sister! Must rectify that. Such a great post!!!! I don't have any boys and just barely got a nephew and have been wondering how to make things for him that don't look girly. i am all revved up to sew for my son now! jessica, you are the best! oh jessica, thank you! i think i'm still in the appliqued onesie stage, but you've given me hope that there's more out there, and i'm gonna find it. seriously, thank you. Yes it is fun, until they grow up and get opinions. I've got a 14 and 11 year old boy and rarely sew for them (It's also not very cost efficient anymore either). The sewing I do do is by special request..."Mom, can you make me a vest like this--proceeds to tell the vision--" or "I need something for this project (insert clothing article to fit time period)". I think sewing in general is a little more fun when you have ultimate say and get to create your vision. That being said, I am having fun this time around on PR&P with my 9 year old daughter and her being involved in the planning stages of each outfit. What a great post! I have three little boys and a baby girl. I have oodles of ideas for sewing for my daughter, but my boys love it when I sew for them too. This is great inspiration! Great rant Jess! I couldn't agree more with pretty much everything. Sewing for boys is so satisfying! Great tips Jess! I would be telling your customers off, so lucky I don't work in your shop. I love sewing for boys! I don't have a daughter, but now have a niece and have no idea how to sew for her! Everything is so girly! :/ I love recycling my hubby's old clothes into clothes for my son. It's so cool to see them have a new life. LOVE all of your stuff!!!!!!! haha love the tip about what would look ridiculous on a man - so true! And I love all the things you make - thanks for inspiring me! Just when I was thinking of what to make for my little boo for kids clothing week challenge... great tips!! Love this post. Thinking about the PRP challenge this week and how I dress my littlest boy, it really is all about the details - I'm not one for too cutesy or too mod, though, so the challenge is how to come up with something relatively simple but somehow cooler or more unique than Target/Old Navy/Gap. And you've done it so well - thanks for your thoughtfulness! thank-you so much, I have 2 small boys and you just provided so much inspiration. Ya our little ones can so rock modern edgy fashions.